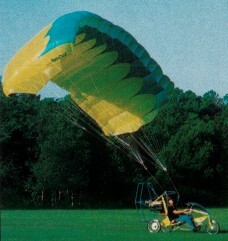 Designed by Orville Lee Floyd III, the Para-Cycle flies as a powered parachute, using a 400 sq.ft rectangular chute from Performance Design Inc, powered by a 40 hp two stroke engine. It pedals on the ground as a three wheel, twenty-one speed tricycle, and drives at up to 15 mph powered by an optional electric hub motor and rechargeable 24 volt battery. The prototype was shown at Oshkosh 1997. On the prototype the pedals are loosened from the bicycle crank and become the parachute foot controls. Robert Baslee of Airdrome Airplanes has teamed with Lee to provide engineering and manufacturing support. The power cage has progressed through several changes. Bike type steering on the ground is conventional with a long-throw handle bar that supports the engine throttle in the left hand and wheel brake and electronic speed control for the optional ground mode electric propulsion in the right hand. The right and left red lines, attached to the disconnected foot pedals on the preproduction prototype, pulls the canopy’s leading edge corners, which controls turns. Changes to be incorporated in the production models included widening the gear track from 47 in to 57 in, lowering the engine 4 in for better ground stability, increasing the airframe tube diameter from 1.25 in to 1.5 in, changing the prop cage from six sided to round. A front hydraulic brake will be optional, the front end length will be customised to the customer, and a larger 452 sq.ft chute will allow up to 250 lb payload. Alternatives to the standard 40 hp 2si 460F-40 engine will be the 50 hp 2si, Rotax 447, and Rotax 503.